We should be trying to avoid wasting water all year round. When we live in houses with fresh running water, it is easy to forget that only 3% of the world’s water is suitable for consumption, and many people don’t have the luxury of such easy access to fresh water. Happily, GROHE have cleverly developed a way to help you manage your water consumption in a more efficient and eco-friendly manner. Now it is easy to use GROHE technology to effectively manage the sustainability of freshwater resources year round within the comfort of your own home. GROHE EcoJoy technology can save you up to 68% of water and has proved to be a great success within several showers and fittings in bathrooms across the country. And it’s not just the bathroom where GROHE EcoJoy can offer effective Eco-sustainability; GROHE technology can be implemented throughout your home, ensuring you live with the comfort and convenience that’s best for you, your family and the environment. 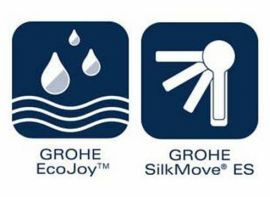 GROHE SilkMove ES technology is a truly remarkable way of managing water and energy as well as offering a smooth and sustainable operation. When in cold-water mode and situated mid-lever, the remarkable ES technology comes into action. Saving on water and energy shouldn’t mean that you sacrifice on comfort or accessibility in anyway, which is why GROHE SilkMove ES provides you with the ultimate experience and convenience. GROHE technology doesn’t take water for granted, and this is effectively proved within it’s technology, offering minimal water consumption whilst providing maximum experience and convenience, and allowing you to truly enjoy the pleasure of your water resources whilst saving energy. This entry was posted in Grohe Spa, Sustainability and tagged grohe spa, luxury bathroom design. Bookmark the permalink.